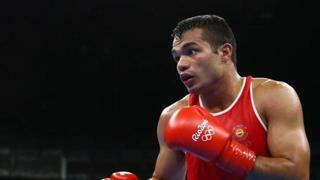 Former Asian Games gold-medallist Vikas Krishan (75kg) and the fast-rising Amit Panghal (49kg) advanced to the finals with tactically contrasting wins in the Strandja Memorial Boxing Tournament for men and women here today. Amit, a gold-medallist at last month’s India Open, defeated Russia’s Soian Artysh to make the summit clash where he will be up against Morocco’s Said Mordaji. Vikas, on the other hand, defeated China’s Tuohetaerbieke Tanglatiha in his semifinal contest. The former World Championships bronze-medallist produced another calculated performance, continuing a fine comeback from a hand injury. The seasoned boxer was savage with his uppercuts and hardly committed any defensive errors to thrash out a facile win. However, last edition’s silver-medallist Mohammed Hussamuddin ended with a bronze this time after going down to Russian Shakhrier Ahmedov in a fiercely-contested semifinal bout. In a fast-paced slugfest, Amit, also an Asian Championship bronze-medallist, showed commendable ring craft to dodge his sprightly rival’s attacks. The Indian connected well on counter-attack and didn’t give Artysh a clear shot despite his perilously low guard. Hussamuddin, on the other hand, was the one launching into his opponent. The Indian boxed with a deep cut above his left eye, sustained in the second round, but did not let that come in the way of a spirited performance. Hussamuddin’s injury needed attention twice in the final round and he went down in a split verdict. Earlier, Asian Championships bronze-medallist Seema Poonia (+81kg) entered the finals, while two other women boxers settled for bronze medals. In the final session late last night, Seema, who got a bye into the semifinals, defeated Bulgarian Mihaela Nikolova 5-0 to make the summit clash along with M C Mary Kom (48kg). Settling for bronze medals in the women’s draw were World Championships silver-medallist Saweety Boora (75kg), former world and Asian champion L Sarita Devi (60kg), Bhagyabati Kachari (81kg), and M Meena Kumari Devi (54kg).